Summer is filled with various holidays and festivities that include the most loved 4th of July. Not only is this a holiday to remember our independence of the United States, but it’s a time to celebrate with friends and family. In order to host the best 4th of July party, we’ve put together a couple items to make your party the talk of the town. It’s important to sport the red, white, and blue in the proper manner. The American Flag is a must with other party decorations throughout the backyard. It’s easily done with a vinyl banner with ‘Happy 4th of July’ printed on with a flag background or a patriotic color scheme. Quality Signs and Banners in Broken Arrow can hook you up with a customized banner for the holidays. Along with a customized holiday banner, if you’re trying to point out various aspects of the venue or stating ‘The party is in the backyard’, we have yard signs that can accommodate your wishes. Yard signs are great for events because they’re reliable and sturdy to stay in the ground where everyone will see them. They’re weather proof too! One of the main essentials for a summer party is the food. What’s cooking? 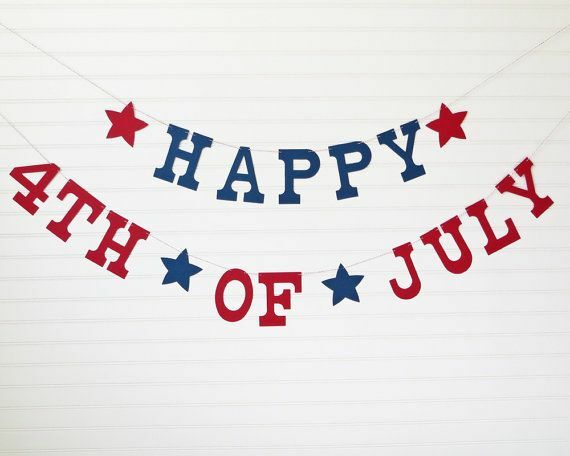 Most parties will incorporate some American loved comfort foods for the 4th festivities with foods such as hotdogs, hamburgers, ribs, and grilled chicken accompanied by chips, veggies, and casseroles. The barbecue atmosphere of the party will bring everyone together and mingle. Depending on where you’ll be hanging out for the 4th of July, it’s essential to sport some Patriotism. Red, white and blue should be shown in some shape or form. Whether you’re wearing a stars and stripes swimsuit or crazy hat, the colors should shine true. Most places will be hot this time of year, so pick something that will keep you cool and looking cool. If you’re in need of vinyl banners or yard sign for the holidays, call us today to customize it! Happy 4th of July! Connect with Quality Signs and Banners on Facebook and Twitter to learn more about our products.